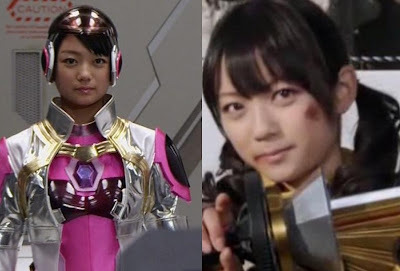 The crossover movie, Super Hero Taisen Z recently had a pre-screening in Japan which gave us a glimpse of the overall impression of the movie and some insights of what transpired. As of this post, the feedback was better than Super Hero Taisen however, the movie still falls short on narration and the too formulaic direction. In summary, there was no lasting impressions. Interesting though, Suzuka Morita still reprises her role as Shelly (Gavan the Movie) in most parts of the film. But in one scene, she did appear as Kotoha/ShinkenYellow. Moreover, Shelly and Kotoha interact at that moment. Shocker returns with power and magic now calling themselves as Space Shocker to destroy the universe. Kamen Rider Wizard, Gavan, Go-Busters and Kyoryugers join the fight against Space Shocker. All your favorite heroes will be back, turning despair into hope. It will be an all new, never seen before hero epic! Kamen Rider × Super Sentai × Space Sheriff: Super Hero Taisen Z will premiere April 27, 2013. Check out the list of actors from this link.